Lightweight and portable, simple to use, is a good tool of survival. Hand see-saw chains with a fast and efficient cutting ability, and can keep a sharp knife in long time. Precision design balanced, low vibration, durable. Mainly used for forest harvesters, wood sawing. Ideal for cutting firewood in survival situations such as campers, backpackers, fishermen, hikers. Handsaws are made of heat treated high strength carbon alloy and steel for long lasting durability; super strong ballistic nylon straps. 24.8 inch saw length, 11 serrations, made of 65 manganese steel with high-strength thick orange handle. It will cut through wood with ease, reduce the amount of time and effort that you need in cutting down a branch. Compact size makes this emergency survival saw easy to pack and take along. User friendly and simple for anyone to use. 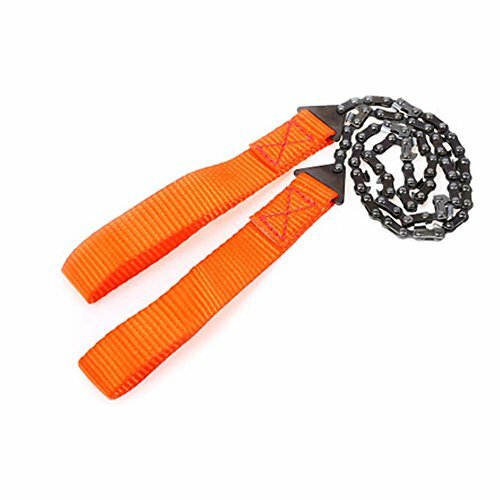 Pocket Chain Saw can be used for home garden fixing, hiking, camping, hunting, firewood collecting, tree-cutting, motorcycling, traveling etc.outdoor activities.